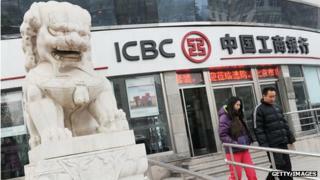 This would allow China's huge banks to conduct business in London with companies and financial institutions, but not to offer High Street services. London is already the main overseas location for trading China's currency, known as the yuan or renminbi (RMB), with $5.3tn worth traded on an average day. Mr Osborne said: "A great nation like China should have a great global currency." "Today we agreed the next big step in making London - already the global centre for finance - a major global centre for trading and now investing the Chinese currency, too." The announcement is part of the chancellor's visit to China this week. A joint statement from the two countries said both sides "welcomed this as an important step that cements London's major role as one of the most important global centres for RMB trading".